If you’ve ever had a major surgery or medical event, you know that the education around recovery leaves much to be desired. When I had a C-section with the birth of my daughter, the hospital gave me a piece of paper that listed some of the medical issues that could take place if my recovery wasn’t going well. But I really had no idea how to handle the recovery. In fact, I made several calls to my physician (and had an untimely ER visit) because of complications. Noora Health wants to change this. The nonprofit graduating from Y Combinator is building hospital education platforms for patients and their family members to teach them the skills needed to recover from a major medical event (like a surgery) or manage chronic conditions like diabetes and palliative care. 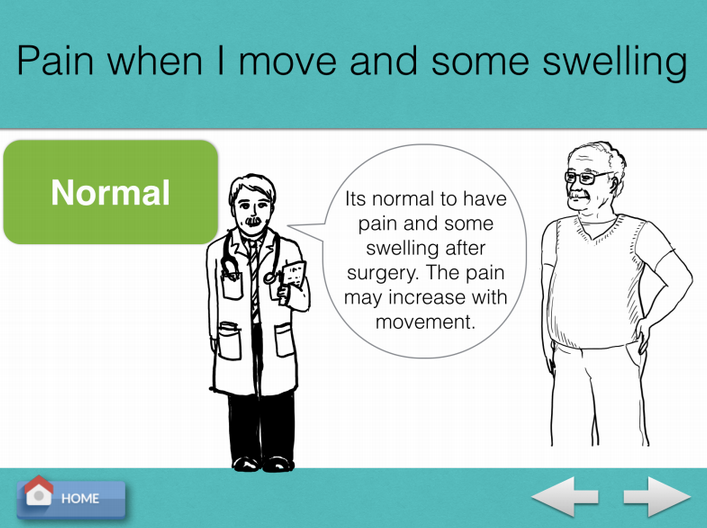 Using an iPad app, Noora Health works with hospitals to offer patients and their families a combination of videos, quizzes and interactive content to teach skills to aid in their recovery at home. The problem that Noora is tackling is real. In the United States, patient 30 day readmission rates for hospitals are at 20-30 percent. Medicare alone spends roughly $17 billion per year on return visits that are preventable with proper education and training. Noora Health will actually supply iPads to be put on patients’ bedside tables post surgery. Patents then self identify by entering basic information related to their condition, and an interactive education program is presented to them based on their condition and circumstances. Part of the program involves giving family members 24-hour access while the patient is in the hospital so they can actually practice some of the skills (i.e. changing a dressing of a bandage) before they go home. Doctors and nurses get reports on the patient’s progress and can see which skills patients are succeeding and struggling with and follow-up with the patient accordingly. Each program has a different focus, and for now extend to new mothers and patients with heart failure (vascular, surgery), Alzheimer’s disease, diabetes and pneumonia. Eventually the organization’s technology will become more customizable to each patient’s specific condition, we’re told. So the program will start taking into account certain medical history data points like whether the patient is a smoker. The non-profit was founded by Edith Elliott and Katy Ashe, who met while developing a program in India at Stanford’s d.school. Once they thought of the idea for Noora Health, Ashe and Elliot thought India would be a good start to bring better health education to a developing country. Specifically, the healthcare infrastructure in India can’t keep up with the growing demand for health services, and there is a need for more doctors and healthcare professionals in general. Through a partnership with a chain of low-cost hospitals in India, Narayana Health, Noora provided their training program to over 6,000 patients and family members. Results were impressive: There was a 23 percent reduction in readmission for open-heart surgery patients. As a side note, Noora’s name derives meaning from the Arabic word for light and was the name of one of the first family members Elliot and Ashe interacted with in the early stages of their nonprofit’s development. With this program in place, Noora Health is now extending this to U.S. hospitals. Currently, the organization is coordinating content and programs with eight institutions, including Stanford Hospital and Santa Clara Valley Hospital (a program for new mothers). Early data shows that the program is reducing readmission rates, increasing knowledge retention, and boosting patient satisfaction rates. What Noora Health is offering is compelling for hospitals, considering the recent changes in reimbursement with the Affordable Care Act. Patient satisfaction and readmission rates are now calculated into the costs for Medicare, Medicaid and MediCal patients. So hospitals are looking to increase satisfaction and reduce readmission rates. As Elliot and Ashe explain to me, Noora Health’s goal is to empower patients with the information they need to truly take care of themselves through design and technology. “Patients and caregivers don’t ever go through a training course like CPR, yet are being put in these very scary situations post surgery,” explains Elliot. Ashe adds that, especially in small villages in developing countries, there is no education. But even in the Western world, she says, patients are confronted with critical decisions and changes following surgery that impact their health for the remainder of their lives. Education and skill training is the best way to help empower patients and families. As someone who did go through a major surgery recently, I would most certainly have benefitted from a better education around recovery. Care In Action from Noora Health on Vimeo.